With all the sales in today’s stores, especially during the holiday season, computing the actual price after discounts can be tricky or tedious! 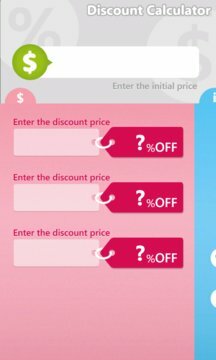 Let's say you want to buy a discount product, how much money is 20% off 129 dollars? how much money is 35% off 248 dollars? So don't waste your time in maths when doing shopping. This application will do the job for you and calculate any discount! Enjoy the sales!